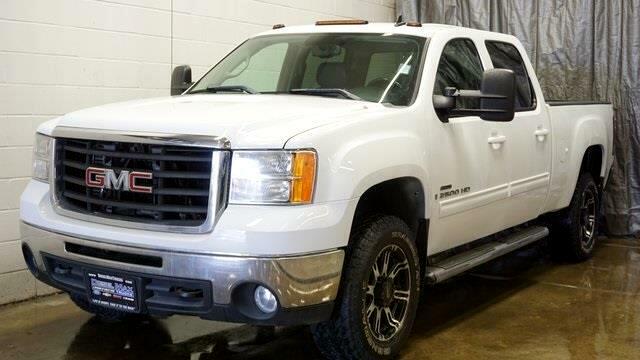 2008 GMC Sierra 2500HD SLT 4X4 DIESEL Clean CARFAX. Sierra 2500HD SLT 4X4 DIESEL, 4D Crew Cab, Duramax 6.6L V8 Turbodiesel, Allison 1000 6-Speed Automatic, 4WD, Ebony w/Ultrasoft Leather-Appointed Seat Trim, ABS brakes, Alloy wheels, AM/FM Stereo w/MP3 CD Player/XM Satellite, Body-Colored Power-Adjust Heated Outside Mirrors, Compass, Dual-Zone Automatic Climate Control, Emergency communication system, Front dual zone A/C, Heated door mirrors, Heated front seats, Illuminated entry, Low tire pressure warning, Remote keyless entry, XM Satellite Radio. Priced below KBB Fair Purchase Price! Odometer is 38504 miles below market average! Specializing in all makes models of trucks both diesel and gas. We have vehicles that no body else does. Please call us directly at (330)765-1200.